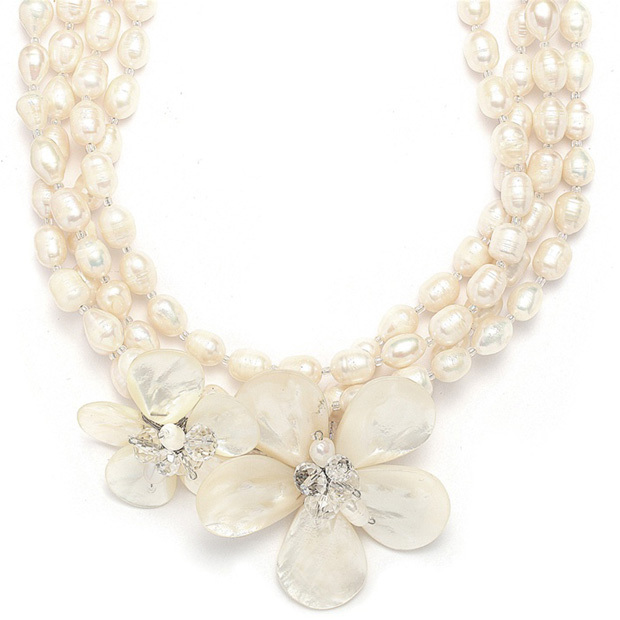 * Mariell's exotic 2-strand bridal necklace features genuine freshwater pearls and mother of pearl with stunning freshwater flowers accented with Austrian crystal oval faceted beads. * This spectacular semi-precious necklace measures a dramatic 38" - 40" and can be worn long or layered for a shorter style. * This high fashion necklace is perfect for your beach or destination wedding and makes stylish summer bridal jewelry. * It has a beautiful coordinating bracelet style MRL-3134B, matching earrings style 3134E or 3135E and a ring style 3134R all sold separately.